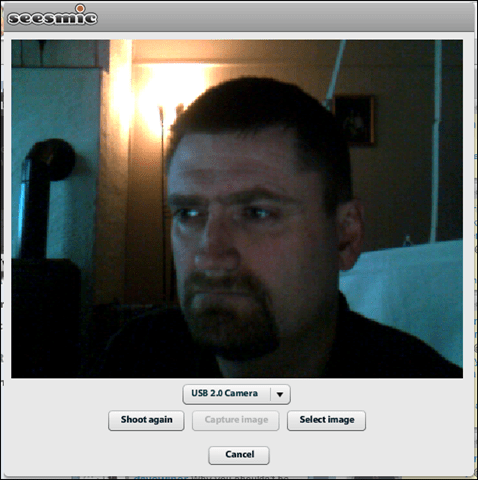 Seesmic Desktop is in many ways an upgrade of the excellent Twhirl application. For many the beauty of Twhirl lays in its simplicity and an obvious concern would then be that a multiple column desktop app would be too busy. Well, no worries. As you can see from the screenshot below Seesmic Desktop is not too busy and a nice looking application. 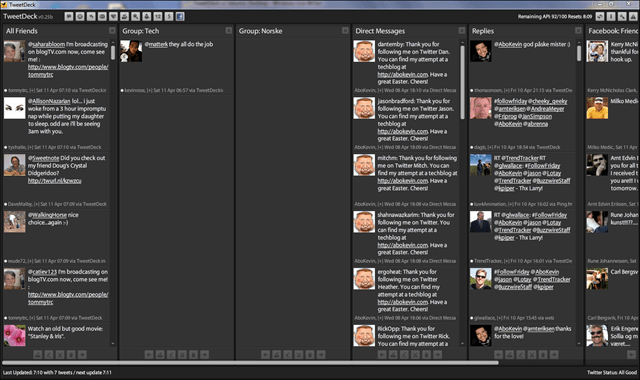 Personally, I like the rather colorful application as opposed to the rather dark default TweetDeck theme. When you open the Seesmic Desktop the first time you only have the Home column open. To add more columns you will have to either choose some of the other immediately available options like Replies and Private, or make your own Userlists or Searches. After having done that you move the new column you have opened to the right by clicking the icon in the upper right corner of the column. After you have moved the column from the “home” position you can close it by clicking the new button appearing in the same place. 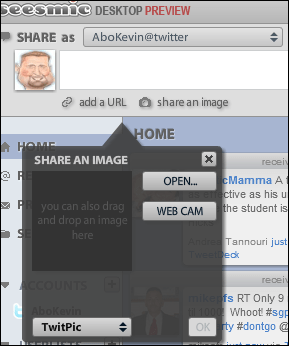 As in most twitter applications you have the choice of adding URLs or picture from within Seesmic Desktop. 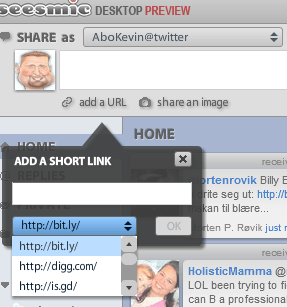 When you choose to add a URL you are offered a dropdown menu with three URL shorteners; bit.ly, digg.com and is.gd. If you want to add a picture Seesmic Desktop offers multiple choices. You can browse your computer for a picture, you can drag and drop a picture onto the dialogue box or you can take a picture with your webcam. As in TweetDeck the user Avatar hides multiple choices; Reply, DM, Retweet and special choices. In the special choices menu you can then choose to Favor an item, add to a userlist or to block a user. The option to add a user to a userlist is the only way to add users to such lists, which in my opinion is one of the weakest points of this application. There is no way to add multiple users to userlists in an easy way, like it is in TweetDeck. After having made such a list, I should in all fairness add that Seesmic Desktop offers a much easier way than TweetDeck to remove users from a userlist; Just choose the option Users and click the remove button to the right of the username; brilliant in its simplicity. There aren’t too many options for a user to configure in Seesmic Desktop. You can add multiple twitter accounts, you can adjust the twitter API usage and you can make some adjustment to how and if notifications are displayed. Under the language tab you can choose between English and… er… just English (more are probably coming?) and under the Advanced tab you can opt in for automatic updates. That’s pretty much it. Well this should be easy to cover; there really are no other services than Twitter that can be used with Seesmic Desktop as I am writing, although I believe that more services will be added in the future considering Seesmics track record when it comes to Twhirl. 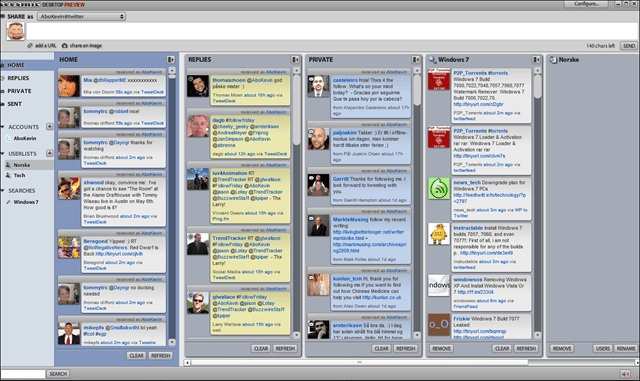 TweetDeck has reached version 0.25b and has been my choice of twitter desktop application for a while now. The UI hasn’t really changed in this version, although it has gotten a new application icon with a yellow background as opposed to the transparent background they used to have. As before you have the multiple columns with they grey/black interface. One new feature is the ability to post status updates to your Facebook account and of course being able to see your Facebook friends updates as well. The top button row now looks like this, with the following choices; Tweet, All Friends, Replies, Direct Messages, Favorites, Groups, Search, Twitscoop, 12seconds, Stocktwit and Facebook Friends. Clicking on one of these buttons will open the corresponding column. If you choose to Tweet the input box opens and from there you can tweet or update your Facebook status, as well as shorten and add URLs or pictures already on your PC/Mac. 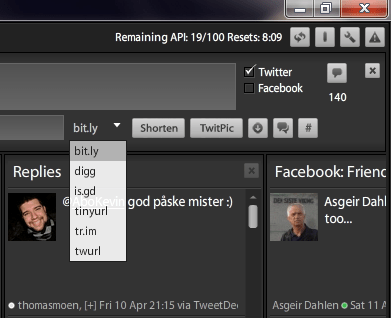 When it comes to URL shorteners TweetDeck offers more options than Seesmic Desktop, you can choose from bit.ly, digg, is.gd, tinyurl, tr.im and twurl. 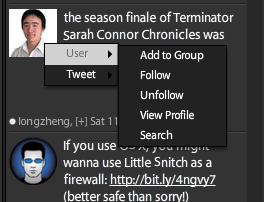 Where Seesmic has its userlists TweetDeck has its groups. TweetDecks way of choosing who goes into each group is far superior to that of Seesmics. You get a scrollable list of everyone you follow and can tick off the ones you want. As I mentioned above each persons avatar also offers choices; as with Seesmic you have Retweet, Reply, Direct Message and Other actions. Other choices in TweetDeck offers more choices than Seesmic does; The User choice gives you the ability to Add to Group, Follow, Unfollow, View Profile and Search, while the Tweet choice offers the following; Favorite, Email Tweet, Translate, Untranslate, Mark as Read and Delete. 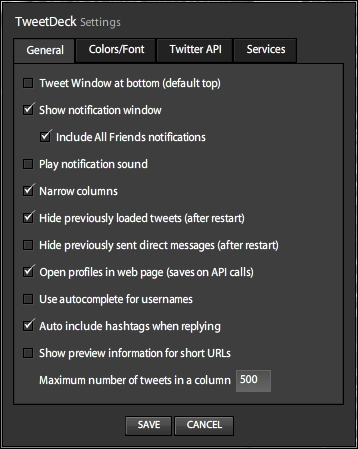 TweetDeck offers a lot of options in their Settings panel as the following screenshot clearly shows and are thus much more configurable than Seesmic Desktop is at the time of writing. As mentioned above TweetDeck now offers the possibility through Facebook Connect to show your Facebook friends status updates as well as posting new updates for your own Facebook account as well. Furthermore you can now post short videos directly from TweetDeck through the 12seconds service. I highly recommend both applications for active twitterers. 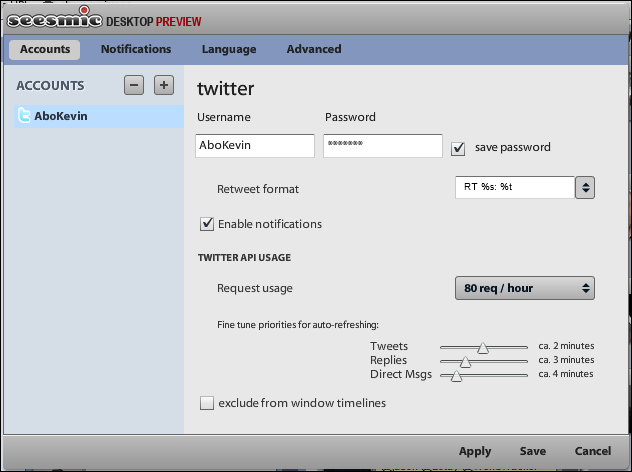 You can get TweetDeck here, and Seesmic Desktop here.